Latest update : 2 July 2011. 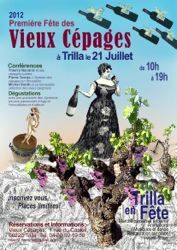 First Festival of traditional grape varieties in Trilla (near Perpignan) on July 21st. Domaine Pierre Cros will be present at the First Festival of traditional grape varieties in Trilla (near Perpignan) on July 21st. You may discover our wines made from historical grape varieties: Les Mal Aimés (the Unbeloved), made from Aramon, Picpoul noir, Alicante and Carignan, Les Vieilles Vignes, a pure Carignan made from a centennially vineyard, Les Costes, our white wine of white and grey Grenache, Vermentino, Picpoul blanc and gris, Muscat. There will be a lot of nice things to see, to taste and to discover – we warmly recommend assisting to the wine tasting with our friend Michel Smith, who will present a great selection of old Carignan wines.